With the New Year's past, the holiday cleanup is upon us. Here is a round-up of local communities' tree recycling programs. Montgomery County residents can drag their Christmas trees to the curb on their regularly scheduled recycling day through February 4. Recycling crews there will grind the trees into woodchips or deposit trees in composting piles. In the District, curbside pickup will run from January 3 to January 15. 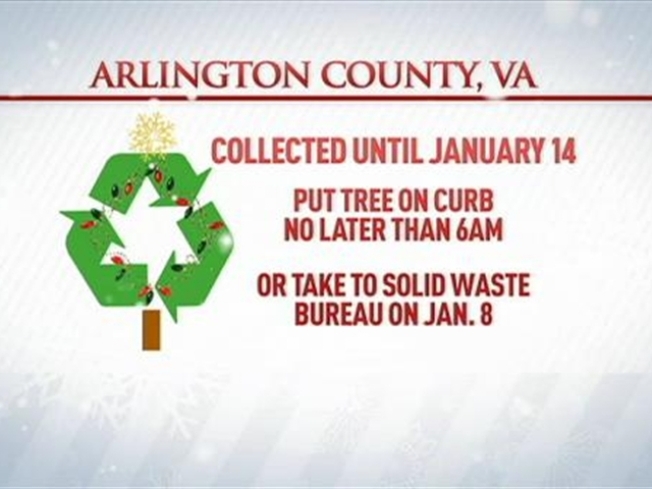 Across the river in Arlington, tree pickup will take place between January 3 and January 14. Trees need to be out on the curb no later than 6 a.m. Residents without regular curbside pickup can drop their trees off directly at the solid waste bureau without an appointment on January 8. In the city of Alexandria, trees will be collected for recycling on Saturday, January 8, and the next Saturday, January 15. The city asks residents to have their trees out no later than 7 a.m. Prince George's County residents can place their trees curbside before 6:30 a.m. on their regularly scheduled waste collection day. Prince George's residents can also drop off Christmas trees from 7 a.m. to 6 p.m., Monday through Saturday, at the Public Convenience Center. The center is located at 3501 Brown Station Road in Upper Marlboro. Loudon County residents can recycle their trees from now until January 20 at the following locations: Claude Moore Park in Sterling, Town Hall in South Riding, Loudon County landfill center in Leesburg, Franklin Park in Purceville, or Game Protective Association in Lovettsville. In Prince William County, residents can bring their trees to the following locations for recycling: the county compost in Manassas, the landfill in Dumfries, Leesylvania State Park in Woodbridge, and Novec in Gainesville. Residents are asked to follow some general guidelines. Trees should not be placed inside plastic or cloth bags. Since these trees will be recycled, any plastic or metal ornaments must be stripped from the branches. Those living in other districts should check with their local government for scheduling. In many areas, trees collected after the allotted holiday tree pick-up period will not be recycled, and instead will be put together with regular trash. Across the country last year, residents bought 28.2 million Christmas trees, according to the National Christmas Tree Association, a trade group.